Veggie Tales has been a favorite of my kids (especially my daughter) since they were old enough to sit in front of a TV and watch a DVD. I always enjoyed them as well. I loved the great animation, the humor, the catchy songs, and the Biblical messages each story shared. 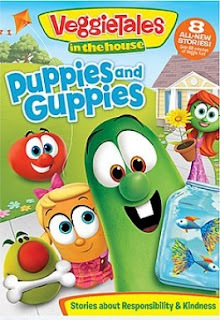 More recently, Big Idea Entertainment has released a new version of the lovable veggies in a Netflix original series called Veggie Tales in the House, and I was sent a copy of Veggie Tales in the House: Puppies and Guppies from Fish Flix in order to give my honest opinion of it. Honestly, I guess I'm stuck in the past because I don't really care as much for the new version. The animation is different, the voices of some of the characters are different, and the songs are not as catchy. But, regardless of my personal opinions, I am thankful the stories are wholesome, family friendly, and include Biblical messages because my special needs daughter was captivated by them (as she is with most cartoons that have lots of colors, action, and music). Family friendly and Biblical are always good things, as far as I'm concerned. So, I appreciate the work Big Idea Entertainment has done to bring these types of shows to our kids. I will not object to my daughter watching these videos again if she chooses. Whether you like the old version of Veggie Tales, or the new version, Fish Flix has many to choose from on their website. They also have a large selection of other family friendly and Christian Movies at very reasonable prices. When you purchase from them, you are helping to support a Christian family-owned company that believes "God is honored by hard work, good service and quality products." If you are ready to give them a try for your next DVD purchase, you can sign up for their weekly e-mail newsletter and receive a $5.00 off coupon.